It is my pleasure to introduce you to Ayomide. 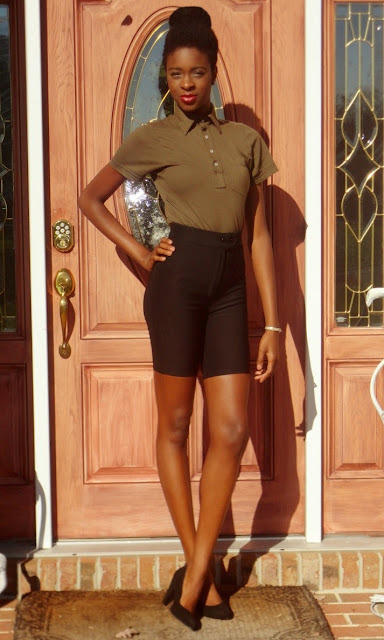 A stylish, intelligent young lady with amazing style. With model like looks, (isn't she gorgeous!) 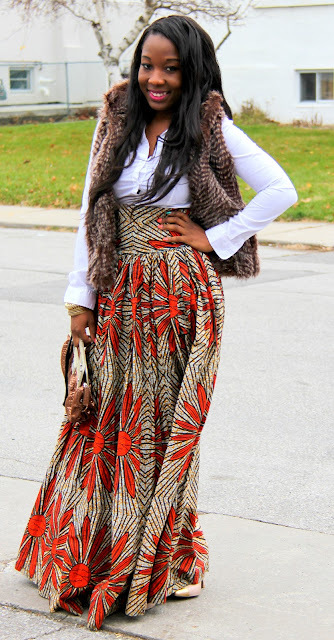 and a style that's truly her own, visiting her blog Fashion Freak African Chic is bound to provide you with tons of inspiration.Read below to find out more about this stunning future doctor and to be inspired. Tell us about yourself, who is Ayomide? I'm a 21 year old recent college graduate. I got my undergraduate degree in Chemistry and plan on attending medical school within the next few years. However, I've always had a deep passion for fashionand personal style. Even while in college I used to wear extravagant(and slightly obnoxious) outfits to class, and picked up a fashion minor while I was there. I'm extremely new to blogging (less than 4 months), but I'm already obsessed with it. I began my blog to share a lot of my controversial thoughts with the world, and also share my hair care journey. It actually wasn't until 2 months ago that I added the fashion and style element, and it quickly became the most popular component. I took a lot of my fashion blogging inspiration from following other bloggers on instagram and facebook. Naomi Campbell, Rihanna, Jessica White and Sessile Lopez. Hmmm.. this is really hard considering I love SO many of my clothes, but I can think of a few stand outs .1. I recently bought this Green Urban Outfitters Maxi skirt that has two slits that come all the way to my hip. I love it because it's often hard for me to find maxis long enough because I'm so tall. 2. Another favorite item of mine are my black combat boots, also from Urban Outfitters. I can wear them with so many different types of outfits. 3. Lastly I have a leather halter top that I bought from Asos. It just fits really well and I love halters. Yes! 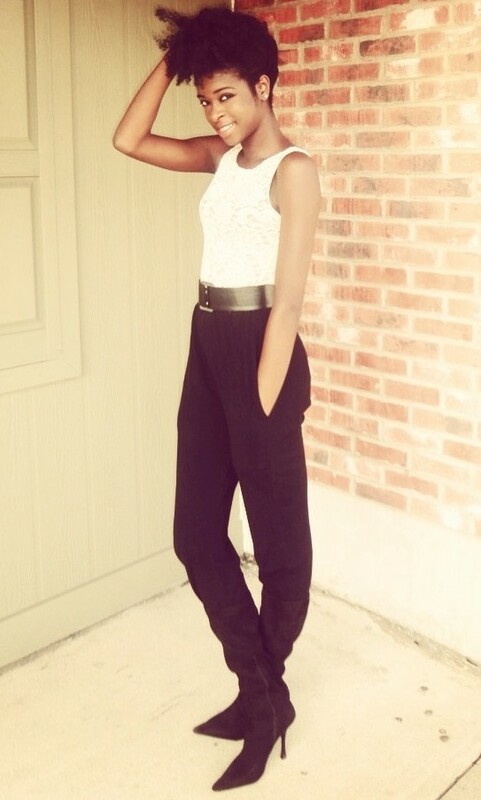 Please help me expand my blog by following at http://fashionfreakafricanchic.wordpress.com/ or check out my facebook page https://www.facebook.com/FashionFreakAfricanChic. And thanks again to Black Fashion Bloggers for featuring me. Be Sure to visit Ayomide's Blog HERE! 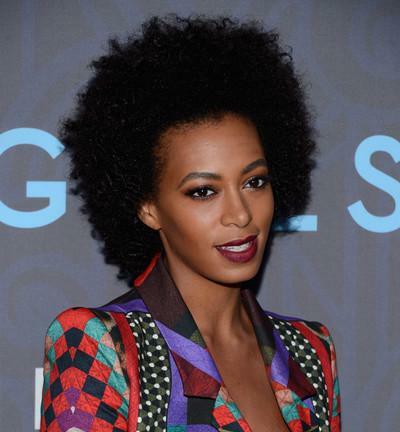 You already know, I love Solange's style! She's not afraid to take risks. She has fun with her style by mixing prints and colors while and wearing her outfits with confidence. Plus her fro is breathtakingly magnificent. She does it yet again in this beautiful pants suit that she wore to HBO's Girls premiere. I'm giving her two thumbs up for this one! I adore Kerry Washington's style, so it's thrilling to see that her character in the hit series Scandal is just as fly! 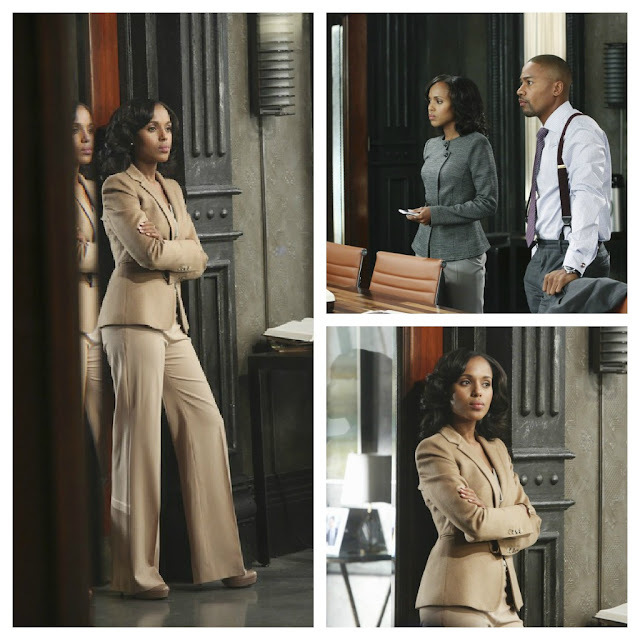 Olivia's style gives the perfect mix of class and sophistication for the modern professional woman. Do you like Olivia's style? There's something absolutely regal about Brenda's style. 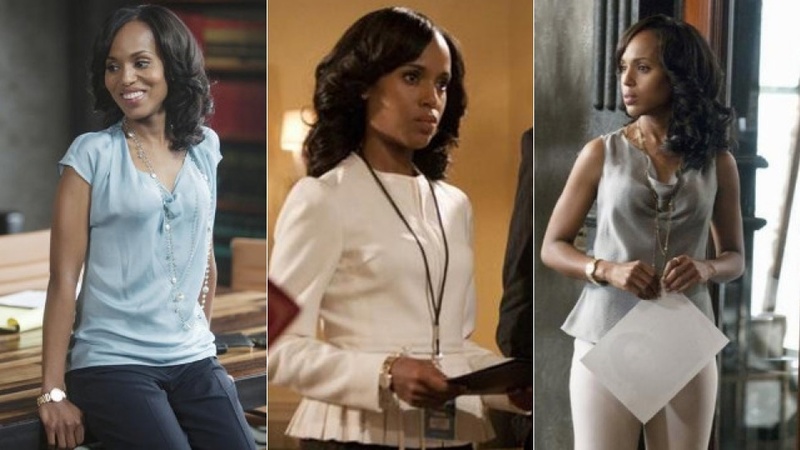 Her looks are classy, tasteful, ladylike and full of style. One visit to her blog and you will see that this woman knows how to wear a dress very well. Looking through her blog you'll find a modern twist on the sophisticated and completely feminine style of some of our favorite style icons. So it my pleasure to introduce you to BFB's first fashion blogger feature of 2013, Brenda and her blog Can Never Be a Skinny Bish. Tell us about yourself, who is Brenda? Brenda is a 22 year old Cameroonian & budding fashion blogger on a budget who loves to shop,help others shop smartly and love the way they look! I have a degree in Biomdeical Sciences but currently work as a Technical Advisor for Sony Canada. I used to post pictures of what I was wearing on Facebook and a lot of people liked the way I dressed & thought I could offer some really good tips to others so they encouraged me to start a blog. I started it first of all to rant and voice my opinions on topics but then it became more of a fashion blog when I noticed people were more interested in what I had to say about fashion than what I had to say about $10 ATM machines,lol. Refined-chic. I love to mix & match,recycle and try bold colors and prints, all while remaining elegant and sophisticated-looking. What are you most looking forward to for blogging in 2013? I'm looking forward to more feedback from followers and really expanding my fan base. I would love to actually become a professional in my own right in this field and who knows where it can take me! be Sure to check out Brenda's fab blog HERE. In other news my sister and I created a budding lifestyle blog, check it out HERE. Happy 2013 Lovelies! A new year is the perfect time to embark on new challenges, create fresh goals and begin a path anew. For 2013, I have decided to begin a hair journey. In three words: I am excited! I have been a member of hair boards for years after first stumbling upon one following an online search on healthy hair practices. For the past few years, I have enjoyed wearing my hair in very short cuts (think pixie and/or teenie weenie afros). Yet for the past year or so, I started experimenting with extensions more frequently and noticed that I enjoyed longer hair. As a result, I decided to grow my own hair. The 5 Hair Archetypes is chock filled with wisdom for anyone (natural or relaxed) interested in growing long hair. Using your archetype ( current hair practices), Sharifa shows you how to build a regimen and achieve your hair goals. In other words, her advice is tailored to fit your current approach to hair care. Instead of working against your hair care methods, she shows you how to strengthen the pros and minimize the cons in your hair care practices so that you can best achieve length and health. For example, if you are an “extensionist” Sharifa shows you how to retain length and maintain the health of your hair with extensions. Or, if you have a low-key approach to hair (“the minimalist”) she shows you a no fuss approach to achieving long healthy hair. In fact, the book features a regimen guide for each archetype. No need to worry if you’re unsure about your archetype, there’s an in depth quiz to help you find out! Another key aspect to Sharifa’s book is that she debunks negative myths surrounding black hair and growth. She encourages the reader to think differently about hair growth as she uncovers the untruths behind common misconceptions that often prevent black women from growing long healthy hair. On debunking the myth that black hair does not grow Sharifa writes, “The belief that black hair cannot grow is not only false and unsupported by science, it’s also an offensive stereotype... The bottom line is that Africans, African-Americans, Afro-Caribbeans, Afro-Hispanics, and everyone else who is a person of color can grow their hair and retain length. The key to growing and length retention is not genetics; it’s regimen.” This is just one of the many limiting common hair myths that Sharifa dispels. Beginning a hair journey and maintaining a regimen to reach your hair goals can seem overwhelming at times causing some to hesitate in beginning a journey or give up before seeing results. No need! 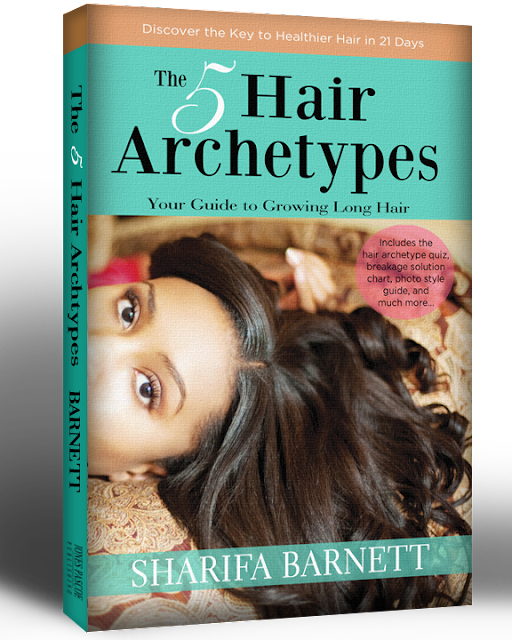 The 5 Hair Archetypes is a great guide book whether you are starting or have already started your hair journey, and will answer many of your questions and concerns that you are bound to have along your journey. It will provide you with step-by-step guidelines on how to go about deep conditioning, maintaining a moisture/protein balance and addressing common hair problems such as breakage. Sharifa even includes a detailed description of her own hair regimen (I'm using it as a guide to build my own regimen) and color photos of the many ways she styles her hair to achieve optimal health and length. For you ladies who created health goals for the new year, you will be pleased to know that there is a section on exercise and hair care! I could go on and on about this book. Sharifa seriously leaves no stone unturned when it comes to hair care. Along with the topics mentioned above she covers a number of other topics including hair types and textures, adjusting to climate changes, and growth aids and tips. If you are looking for a well-written and well-researched and documented comprehensive hair guide to growing long hair, The 5 Hair Archetypes is the book for you.